"Pursuit Fitness is my special thing. It’s a social thing, as well as a workout, and I really enjoy it. My special thing is always coming to Pursuit Fitness." Six years ago, Billie Jean Diekamp had to help her mother move into a nursing home. Her mom did not have the same mobility she did when she was younger, and she just could not take care of herself anymore. That was a lightbulb moment for Billie Jean. She decided that she never wanted that to happen to her. Her two adult daughters had planned a meeting with Pursuit Fitness and Performance owner, Ryan Morgan, and encouraged her to come along. Billie Jean was worried that she wouldn’t fit in at Pursuit. She had problems with one of her knees, and was unsure if she could keep up with the exercises. Once she met Ryan, though, she was convinced that she could start at a level she was comfortable with, and gradually progress through the program. Billie Jean maintains a healthy lifestyle and, along with her daughters, has always been conscious of having a healthy diet. “I watch (my daughters),” she says. “And I get a lot of recipes from the PFP website.” But for Billie Jean, weight loss is not necessarily her main goal. She’d like to maintain her current weight, while still staying active and remaining independent. 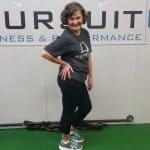 For Billie Jean, it’s this personal connection that makes Pursuit Fitness a special place. “I’ve seen other gyms on TV,” she says. “It’s just rows and rows of equipment and people. I wouldn’t want to do that. I’d be too embarrassed. But I don’t feel like that at Pursuit. I feel welcome. It doesn’t matter how old I am.” She enjoys the small, personal aspect of the gym, and the fact that trainers have tweaked programs to suite her needs. “If there’s something I can’t do they work it out so that I can do an exercise a certain way and it doesn’t hurt or anything,” she says. Favorite workout music: Oldies. One time they had us write down songs for a Pursuit playlist. I put an Oldie down and nobody else liked it! But you just can’t stop when you hear that song! Currently Reading: My nieces have talked me into reading “Harry Potter.” I’m on book 4 and I’m starting to get tired of it, but I’ll finish it for them. Hobbies: My great-nieces are my hobby. It’s not a job. I just do it so that their families have someone to care for them. They’re so loving. Sure, they have bad days, but they are so much fun and they show so much love.